It's been another crazy week at the Tour de France. You may have seen I had a bit of a crash on Monday's stage into Gap but the race has been a dream so far both for Team Sky and me personally. I did not expect to be sixth overall on the second rest day, especially after what happened on Monday. At Team Sky we've had the usual doping accusations but spectators throwing urine at our race leader Chris Froome and punching Richie Porte is when it gets ridiculous. Where am I going to hit that? Monday's crash happened pretty quickly on a downhill section and was so unexpected I barely had time to think. I was braking into a corner and the next thing I was T-boned by Warren Barguil. I remember seeing the pole at the side of the road and thinking 'where am I going to hit that?' I was just trying to avoid properly headbutting it, which I didn't quite manage to do. I took a good clout to the head and then went about eight feet down a steep embankment. I was pretty fortunate because a bush stopped me falling too far. You work hard on the climbs, doing your bit to help Froome and then all of a sudden you get smashed straight off the road. It was not the best way to finish the stage. It was good of the spectators to help me back on to the road and I knew I was not too badly hurt so it was all about getting going again. I've certainly had worse injuries - I fractured my pelvis on the first stage of the Tour in 2013 but managed to reach Paris three weeks later and finish the race. My fiancee, Sara, was doing some commentary on the race for Welsh TV channel S4C and she started crying. I don't think she was commentating too much after that. Fran Miller, who works for Team Sky, rang her to tell her they were trying to find out if I was OK. Sara saw Fran's name come up on her phone and thought 'oh my god, what's happened? It must be bad'. I don't really care if people are shouting "doping" at us, or booing. We know we are competing in the right way. But when it comes to spitting, punching and throwing urine at riders, that is when it is ridiculous. It is only a small minority, they are not even cycling fans, they are more like football hooligans. These people don't need to come. They are not there to watch the race. It can be difficult to keep your cool. When you are in the middle of the race, all you are thinking about is doing your job and holding the wheel in front. But when you are out the back, maybe on a climb near the finish, it is intimidating when there is a group of people hurling abuse at you. They can be pretty aggressive. You just have to ignore it though and get on with the race and do your job. Can't they just see a good rider is a good rider? Froome has only taken a minute and a bit out of Nairo Quintana on the actual climbs. It is not like he is phenomenally different to anyone else. He had that really good day in the Pyrenees. After a while, there is nothing you can do. Haters will be haters. The whole Tour has been a dream so far. It has been great with Froomey riding so strongly and individually for me it was great in the Pyrenees. I did not expect to be sixth this far into the race and just five minutes behind the leader. We have four more days left because you don't really count the stage into Paris, which is more processional, unless you are Mark Cavendish or one of the sprinters. We are in a great position but we still have the Alps to go and the the last two stages are particularly unpredictable. I am sure we will get attacked from everywhere. Nibali has lost a lot of time and is almost eight minutes back but is still dangerous, while Quintana, at just over three minutes down, is probably the most threatening. And Alberto Contador might be more than four minutes adrift but he knows how to fight and win a Tour. Tejay van Garderen is third, 20 seconds off Quintana. He is not as explosive as the others on the climbs, he's a bit more like me - a diesel - so we won't have to chase him down if he attacks. Man v man Froomey can match them but they will look at other ways to isolate him with team-mates going on the attack, to put our team under pressure. The main thing we have is the ability to communicate well on the road and there are no egos. If somebody does not feel too good, they'll say 'I'll ride a bit earlier, you ride later' or vice versa. That is the key to our success. Being able to mix up the roles and not just being dead set on one plan. It's nice when you hear people saying I could be a future team leader. 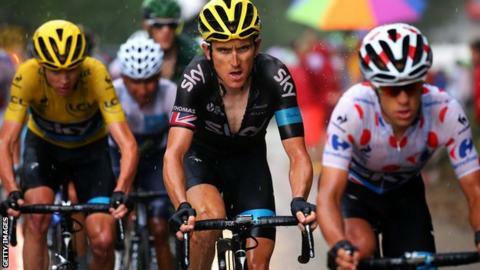 What made me think I really want to give my best on the road was seeing Sir Bradley Wiggins win the Tour in 2012. That was my last year on the track and then I dedicated myself to the road. It has been incredible. I said at the start of this year's race I wanted to be there at the end of the mountain stages, and on the third day in the Pyrenees, I was with Froomey all the way to the line which was just crazy. I have always been consistent, but in previous years there have been better climbers than me. Every year I have been getting better but I have made the step up this year.